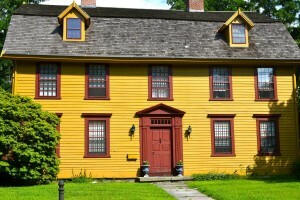 This house was built on John Bradford’s home lot in 1660 and is one of the oldest surviving houses in Norwich. John Bradford’s father was William Bradford, Pilgrim Governor of Plymouth Colony in Massachusetts, and his mother, Dorothy May Bradford, tragically drowned upon anchoring in Cape Cod Harbor on December 7, 1620. John Bradford did not travel to the new world with his parents on the Mayflower, but crossed the Atlantic at a later date and is listed as a townsman of Norwich in 1671. Upon his death in 1676, the property passed to his nephew Thomas Bradford who sold to Simon Huntington Jr. in 1691. 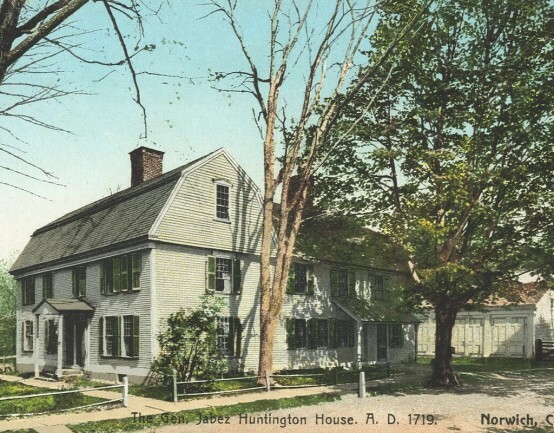 In 1736, Simon Huntington Jr. passed the smaller house and land to his son, Captain Joshua Huntington, a well-known merchant who traded extensively in the West Indies. Tragically, Joshua died of yellow fever in 1745 at the age of 45 and deeded his son, General Jabez Huntington, the homestead. General Jabez Huntington, a wealthy trader, presided over the lower house of the Colonial Assembly as speaker. He was appointed the Major General of the State Forces during the Revolutionary War and corresponded with General Washington, Marquis de Lafayette, and Gov. Trumbull. George Washington spent the night in the house on April 8, 1775. General Jabez Huntington retired in 1779 due to his deteriorating health and died in 1786. At his funeral, it was said that General Huntington “sacrificed his ease, his health, and eventually his life, to serve and save his country.” The house originally had one room, but was added on. Jabez added the gambrel roof, central stone chimney, attic overhang, and pediments over the end windows making the house more Georgian in style. Colonel Joshua Huntington was the third son of General Jabez Huntington and volunteered for the army upon learning of the Battle of Lexington. Huntington served during the siege of Boston, and the 1776 campaigns of New York and New Jersey. Later, he was an agent of Wadsworth and Carter assisting in supplying the French Army in Newport Rhode Island with provisions. By the end of the war, Joshua earned the rank of a colonel. In 1789, he was appointed county sheriff, an office he held until his death in 1821. His home is constructed in the Georgian style.